Prepare pastry for single-crust pie, being careful not to stretch dough too much. Place in pie plate and trim and crimp the edge. In a large mixing bowl, stir together the sugar, flour, cinnamon, and salt. Add apple slices and gently toss until they are coated well. FOR CRUMB TOPPING: Stir together brown sugar, flour, and oats. Using a pastry blender, cut in the butter until topping resembles coarse crumbs. Sprinkle over apple mixture in pie. Bake at 375 degrees Fahrenheit for 25 minutes. Remove foil and bake 25 to 30 minutes more, or until top is golden. 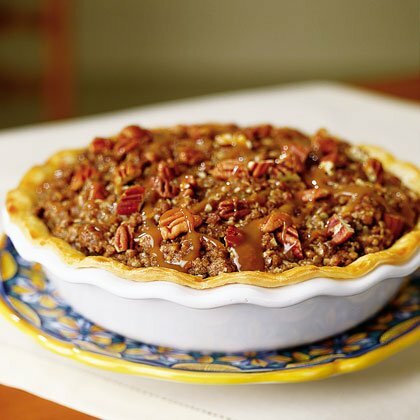 Drizzle top with caramel topping; sprinkle with pecans.